Business Sector: Internet home shopping. Tesco.com started in 1997. It is the home delivery element of Tesco, specialising in delivering goods ordered on-line to its customers within a two hour time slot. It began with one van in North London. 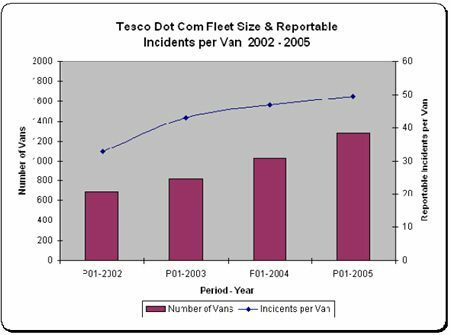 To date (June 2008) Tesco.com have some 2200 vans and employs 7000+ Drivers (Customer Delivery Assistants) covering approximately 60 million miles and has an annual turn over of £1.3 billion. Its delivery network covers over 98% of the UK population. In 2005 Tesco.com reviewed its duty of care provided for its drivers (CDAs) and recognised that it had not provided its CDAs with the level of training and duty that it would ideally provide. This started a top to bottom review of its training and working practices. This initially began with a programme based on selecting a few good existing CDAs from within the company to train their peers. After 6 months experience with this process Tesco.com decided that a different approach was required. Tesco.com engaged RoSPA (Royal Society for the Prevention of Accidents) to carry out a review of the company’s driving policies and procedures. The main finding of the review was that a consistent level of training was required across the country. The initial solution was that Tesco.com trainers delivered theory on safer driving to its CDAs and RoSPA trainers would deliver the practical “on the road” training. However, the results of this process did not match the company’s expectations. As a result, a partnership was formed with RoSPA to assist and support in being our main supplier of external driver training in the development of practical Occupational Road Risk training over a two year period whilst an in-house training team was developed. Whilst running in parallel with the work being commissioned with RoSPA, the recruitment of an ORDIT trainer was taken to train existing managers to be Approved Driving Instructors, at its new Croydon Tesco.com only facility. Its was felt that the area training managers should be fully qualified Driving Instructors and Fleet Trainers enabling them to execute there tasks correctly and for them to gain credibility among the CDAs. In addition we are now committed to the independent assessment and auditing of the Driving Standards Agency to help maintain our training standards. This process all started with Mr Cliff Cheeseman developing a small pilot scheme in the South East of England consisting of 4 Tesco.com Managers and 4 RoSPA Trainers. This has now grown to a team of approximately 40 trainers and managers. From the outset, the company recognised that changing attitudes and behaviour among its drivers was the key to it success. However, a key insight for the company during this period was the recognition that the role of its delivery drivers was more complex than “just driving” and also involved the critical interface with the customer and the general public which impacted upon the company’s image. Implementing a process to assess and review regularly the risks. The need to ensure that DMSs reinforced CDA Training and prevented the training benefits from being lost once the CDAs began their work. The Skanska fleet consists of cars, light commercial vehicles (vans and tippers) and heavy goods vehicles (tippers, MEWPS, traffic management vehicles, vacuum excavators and coaches). The predominant use of the vehicles is for transportation of workforce and equipment to work sites, apart from the specialist vehicles listed above. Skanska has three operating licences and works throughout the UK. Tesco.com proactively sought the advice and help of many organisations so that a balanced and comprehensive and sustainable training and development program could be implemented. An on-going program of any employee wishing to drive a Tesco.com van has to complete a DVLA mandate form so that we have the capacity to check any CDAs driving licence for legalities; in addition to this driving licences are checked every 6 months. 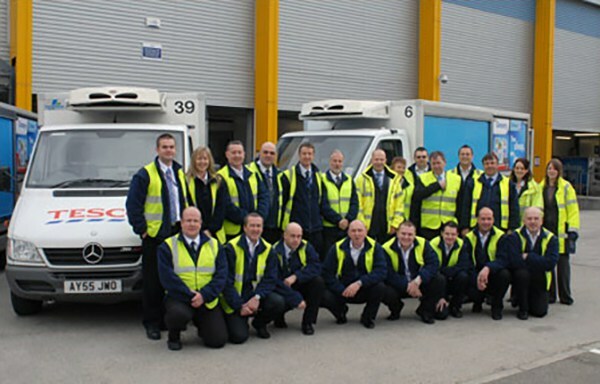 As a direct result of the improvements made within the company Tesco.com was able to win RoSPA the prestigious RoSPA MORR Trophy in the Royal Society for the Prevention of Accidents Occupational Health and Safety Awards 2007. Prior to recruitment all prospective CDAs undergo a standard assessment process and in addition to this a strict driving assessment, this at times can lead to a failure rate well over 75% (depending on location). To help reduce the severity and number of Road Incidents involving our CDAs an Accident Review Board (ARB) reviews incidents on a weekly basis. This is designed to actively engage the CDAs and to ensure the process is transparent and fair. The process involves 3 conference calls covering the UK. Each call has a Chair, two Training Managers and two CDAs. The two CDAs determine if the incident was preventable or not and the Trainers determine the level of training if required to up skill the CDA’s. This in turn is linked to a performance management process. Tesco.com has also implemented a Police Liaison and Crash Investigation Team, on call 24/7. This is a group of 8 Managers who have been trained to investigate Road Incidents, capture data and information to enable the building of a case file and to liaise with local Police to provide the fast and accurate delivery of information, supporting both local managers and the Police in their enquiries. 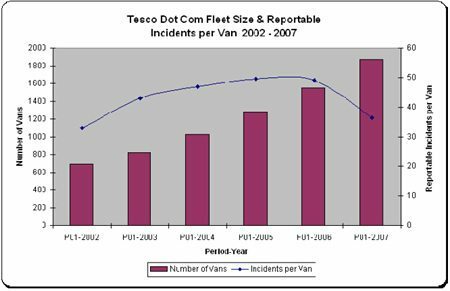 Tesco Dotcom has seen a significant reduction in the number of incidents since introducing this training. CDAs who have been trained within the scheme are demonstrating a 12% reduction in incidents over their peers who have not been similarly trained. In one trial in North London, the accident rate involving CDAs trained in the process reduced by 40%. A significant by-product of the process was that the company’s procedure for ensuring legal compliance was improved. In particular, driver records, van records and pre-deployment checks were significantly enhanced. The Company has made a 23% saving on its van damage (bent metal costs) alone to date, since the introduction of the driver training team in 2005. This despite the fact that the fleet has grown in this period from 1200 vans to 2200 vans – a significant benefit. Driving for Better Business is a Highways England programme to raise awareness of the significant benefits that employers in both the private and public sectors can achieve from managing work-related driving more effectively.